In December 2007, after being adrift for about a month, an American couple crashed their 42 foot boat into the reefs surrounding Fanning Island in the Republic of Kiribati (pronounced Keer-ee-bas.) This is on the Equator on the other side of the date-line, in what is loosely referred to as Micronesia. 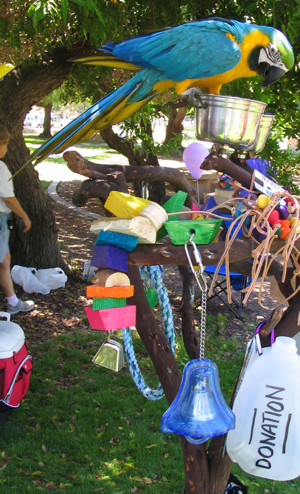 The couple were traveling with a dog, Snickers, and a Blue and Gold, Gulliver. They abandoned their animals when they were able to leave the Island. 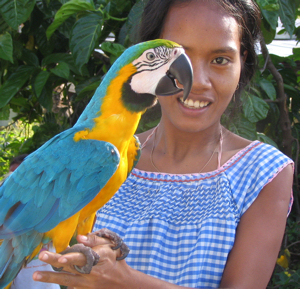 The animals lived under threat of death as there is a strict non-importation law in Kiribati. Additionally, both animals had left the US without proper paperwork to insure their re-entry. The dog was adopted by Jack Joslin (Las Vegas) and removed from the island in April with the help of Hawaiian Humane Society. They also tried to Bring back Gulliver, but without success. 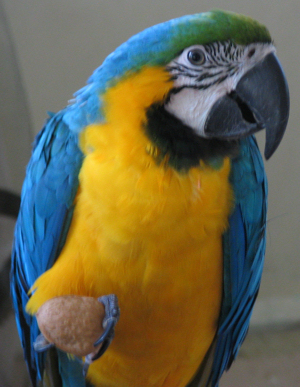 Since Blue and Gold Macaws are CITES II (Convention on International Trade of Endangered Species) animals with II meaning Threatened --- there were a myriad of difficulties in attempting to bring Gulliver back home. He did not have a closed band nor did he have a microchip, so there was no "proof" that he was in fact US captive-born. He was therefore treated as though he were a "wild" macaw! By the time The Oasis was contacted, Gulliver had been in Kiribati for four months. His time was running out! We worked our way through numerous bureaucracies in the United States, as well as internationally, in order to get Gulliver back to The Oasis. We worked with the US Department of Agriculture (USDA), the US Fish and Wildlife Service/CITES (USFWS) as well as the CITES Secretariat in Geneva Switzerland, the US embassy in Fiji and the government of the Republic of Kiribati. We obtained a Private Detective (who worked pro bono) to gather information on the bird in an attempt to prove his US provenance. We had two attorneys (pro bono) working with us. There were people in Hawaii, people in Kiribati, people around the states, all working in an attempt to bring this beautiful bird to safety. It took three months before Oasis Vet Todd Driggers and I were able to get all the papers in order and finally go to Kiribati to bring Gulliver back and into US. On July 8th Gulliver landed at the Port of Los Angeles and entered Quarantine. Many people have asked why the original "owners" of the bird did not get the bird back. It is complex, but 1) Since they did not get appropriate paperwork before leaving the US, USFWS would never (they told me) give the bird back to them; and 2) As a CITES II animal, Gulliver had to go to a "zoo or educational facility" where he could be "on exhibition." It took over a month but we finally were granted approval as an appropriate venue for Gulliver to live his life. Ultimately we were able to find the original owner (it took over two months!) She most willingly signed Gulliver over to The Oasis. The Oasis existed to "save birds one at a time" - birds for whom there are not other options. Gulliver certainly had no other options. But Gulliver also is representative of all the birds who have been abandoned everywhere: birds relegated to basements of garages; bird dumped at Humane Shelters and pounds; birds brought to Veterinarians to be euthanized when they re no longer wanted. 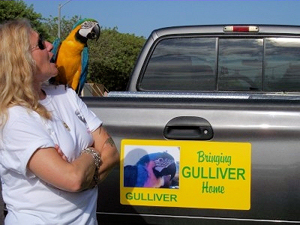 Gulliver is the "Spokes Parrot" for them all. On July 25th I received the best possible news: Gulliver's mandated USDA tests all came back negative and he was released on August 7th! !